It hasn’t been an easy market since the S&P 500 hit its high on September 21. The index is down 7% from the peak and fell as much as 11% at the low in October. After riding a bull market for nine years, the recent rough patch has investors thinking about diversifying out of stocks and into other assets. A question I often receive is whether or not it’s time to buy gold. Most investments are valued based on their future cash flows or growth prospects. When we look at a stock, we analyze the likelihood of growth of the business and determine an appropriate value. We do the same with a bond. The only difference is that we place greater emphasis on the likelihood that the company will pay interest and principal on the bond. Investment real estate is also valued by future cash flows. With gold, you’re simply relying on someone paying more for it than you did. Though there are arguments to be made that gold is the only real money, the truth is, it’s just a piece of metal dug up from the ground that has no intrinsic value. Because of that, I don’t believe gold deserves a prominent place in investors’ portfolios. Having no intrinsic value, it’s the same as owning a cryptocurrency, other metals or baseball cards. Granted, gold will behave differently than crypto, collectibles and other metals, but it’s worth only what someone else is willing to pay for it. While you could make the same argument about a stock, it really doesn’t hold water. A business has assets that can be clearly valued. If the business had to be liquidated, there is a specific minimum valuation that an investor could be reasonably sure they’d receive. With gold, that number doesn’t exist. 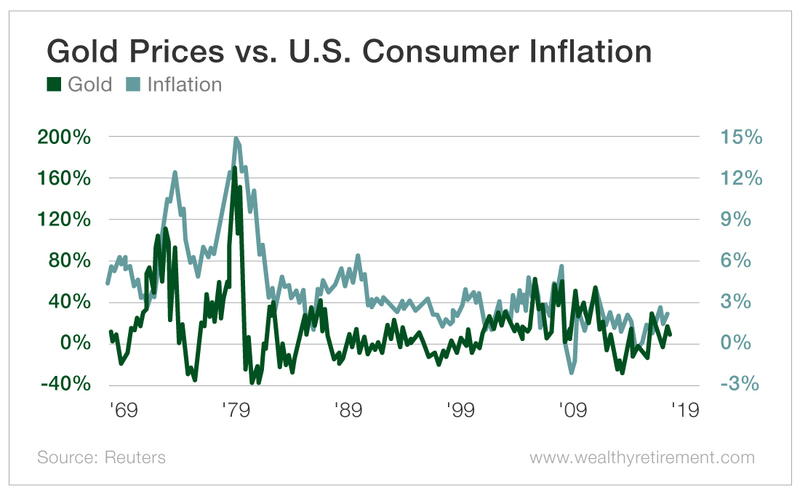 Additionally, gold is seen as an inflation hedge, but that view is also misguided. The only time in recent memory that gold performed well during an inflationary period was during the extremely high-inflation period of the late 1970s and early 1980s. Otherwise, gold’s performance generally has not been correlated to inflation. You can see that after the high-inflation period of the disco era, gold did not perform well as inflation grew in 1983, 1987, 2005 and 2017. Gold did move higher when inflation rose in 2002, 2007 and 2015. Gold never seems to act the way you think it will. It plummeted during World War I and World War II of the last century, and since 1915, it has had a dismal 0.89% compound annual growth rate. That being said, I do believe gold deserves a place (albeit small) in your portfolio for one simple, but very important, reason. It is a noncorrelated asset. In other words, the price of gold will not necessarily follow the prices of stocks. In the eight bear markets or corrections going back to 1976, the S&P 500 declined an average of 28.3%, while gold advanced an average of 7.9% during those periods. However, it’s not a slam dunk that gold will rise during a bear market in stocks. In two of those bear markets, the price of gold fell, including a whopping 46% from 1980 to 1982. The Oxford Club recommends you keep 5% of your portfolio in precious metals. I believe that approach makes sense so that you have at least a little bit of your capital invested in an asset that is independent of the stock and bond markets. I have a tiny bit of my portfolio invested in precious metals and need to increase my exposure to gold – not because I think gold is at a bottom or that it’s the perfect time to buy it, but because I need more diversification in my portfolio. Besides, my mom threw out my baseball cards years ago. If you need help with gold purchases, feel free to contact Richard or Michael Checkan at Asset Strategies International at 800.831.0007. I’ve known them for years. The post Is Now the Time to Buy Gold? appeared first on Wealthy Retirement.